Button-like objects of stone, glass, bone, ceramic, and gold have been found at archaeological sites dating as early as 2000 B.C.E., but evidence suggests that these objects were used as decoration on cloth or strung like beads. Nevertheless, they have the familiar holes through which to pass a thread, which gives them the appearance of the button currently known as a fastener. Buttons can be divided into two types according to the way they are attached to a garment. Shank buttons have a pierced knob or shaft on the back through which passes the sewing thread. The majority of buttons are this type. The shank can be a separate piece that is attached to the button or part of the button material itself, as in a molded button. Pierced buttons have a hole from front to back of the button so that the thread used to attach the button is visible on the face. Almost every material that has been used in the fine and decorative arts has been used historically in the production of buttons. Buttons exist in a variety of materials: metals (precious or otherwise), gemstones, ivory, horn, wood, bone, mother-of-pearl, glass, porcelain, paper, and silk. In the late nineteenth and twentieth centuries, celluloid and other artificial materials have been used to imitate natural materials. The precursor to the button fastener was the fibula, a brooch or pin used to hold two pieces of clothing on the shoulder or chest. The button began to replace the fibula at least by the early Middle Ages, if not sooner. Buttons functioned as primary fastenings for men's dress earlier than for women's. This may be due to the fact that the women's, from the late Middle Ages into the twentieth century, was required to be tight and smoothly fitted. Lacings and hooks are better suited to providing the strong hold and smooth appearance necessary for tight-fitting garments. One of the earliest extant pieces of clothing to show the use of buttons as fastenings is the pourpoint of Charles of Blois (c. 1319-1364). This new outer garment was fitted in the body and sleeves, with buttons used to close the front and the sleeves from the elbow. At this point, however, men's lower garments (hose, and, later, breeches) were still fastened to their upper garments, or to an interior belt, by points (laces of ribbon or cord decorated with metal tips). These points with metal tips were often attached as purely decorative pieces to both male and female apparel. There are records of buttons in documents relating to nobility during the late Middle Ages and the Renaissance. For example, Philip the Good, Duke of Burgundy (1396-1497) ordered Venetian glass buttons decorated with pearls, and Francis I of France (1494-1547) is said to have ordered a set of black enamel buttons mounted on gold from a Parisian goldsmith. These were obviously special buttons of the same quality as contemporary jewelry. Buttons of any material were generally round in shape and made of decorated metal or covered with needlework in silk or metal threads on a wooden core. The ball-shaped toggle button is probably the type of button that replaced the fibula as a fastening for cloaks, capes, and other outer garments. A sixteenth-century example exists in Nuremberg hallmarked silver, attached to a thin bar by a flexible chain link. The eighteenth century is considered the Golden Age of buttons by collectors, as the variety of styles, as well as the physical size of buttons increase dramatically. Men's coats required buttons at the front opening, sleeves, pockets, and back vents. Waistcoats and breeches were also fastened with buttons. The size of the button grows and the shape generally flattens during the course of the century, ending in the flat disk as large as 1.38 inch (3.5 cm) in diameter. The value of decorations on a man's ensemble during this period, composed of metal thread embroidery and jeweled buttons, could account for as much as 80 percent of the cost of the suit of clothes. Thus, luxurious buttons became an increasingly essential part of the expression of status in upper-class men's dress. In Denis Diderot's Encyclopédie (c. 1746) the creativity of button-makers is exalted, though for moralists costly buttons became one sign of excess in fashion. The newly fashionable paste jewels (imitation gemstones) appeared in the 1730s and were used to create some of the most highly prized buttons of the nineteenth century. Georges Frédéric Strass, a Parisian jeweler, perfected techniques of making these glass jewels. As the button evolved from a ball to a flat disk, another notable change in decorative technique was the use of the button as a palette for painting. Representational images became immensely popular in the second half of the eighteenth century and are related to the miniature portraits that were worn as pendants or pins during the period. Portraits and subjects like rococo genre scenes, historical events, tourist views, and architectural monuments were produced. An extraordinary set of French portrait miniature buttons was made about 1790 and included portraits of personalities from the French Revolutionary period; each portrait was set in silver with paste-diamond border and the name of the sitter engraved on the back. Artists of note participated in the production of portrait buttons; Jean-Baptiste Isabey (1767-1855), a miniature painter and pupil of Jacques-Louis David, records that he painted decorative buttons at the beginning of his career. By the second half of the eighteenth century, button making in Europe fell into two categories: French button production remained a craft tradition allied with other high-quality decorative arts, while the English button industry developed mass-production techniques. Probably the most influential of the new English technologies was the development of cut-steel buttons and accessories by the steel manufacturer Matthew Bolton (1728-1809) of Birmingham in the 1760s. Bolton's cut-steel or faceted steel buttons were one of the most prevalent styles of the last three decades of the eighteenth century. The polished and faceted surface was created to imitate that of faceted gems or glass and the effect was quite successful. The ceramic manufacturer Josiah Wedgwood began producing buttons made of his popular jasperware in 1773 as part of a collaboration with Matthew Bolton, who created cut-steel settings for the ceramic buttons. Jasper-ware ceramics, with their neoclassical motifs derived from cameos, had become the trademark product of the Wedg-wood factory and the buttons were available in five colors and a variety of shapes. Another innovation in the ceramic industry, that of transfer printing, created a new type of ceramic button decorated with designs derived from copperplate engravings. At the end of the eighteenth century, buttons made from mother-of-pearl began to rival in popularity those of steel. The eighteenth-century Enlightenment sensibility manifested itself in several unique types of buttons. Faithfully depicted insects and animals became the subject of button sets, as did buttons created from semiprecious materials such as agate, in which the natural patterns of the stones were the only decoration. The highlight of this natural history trend is probably the so-called Habitat buttons, which contain actual specimens of insects, plants, or pieces of minerals encased under glass domes. The standardization of military uniforms in eighteenth-century Europe led to the production of specialized buttons that continues to be a major portion of the button industry today. 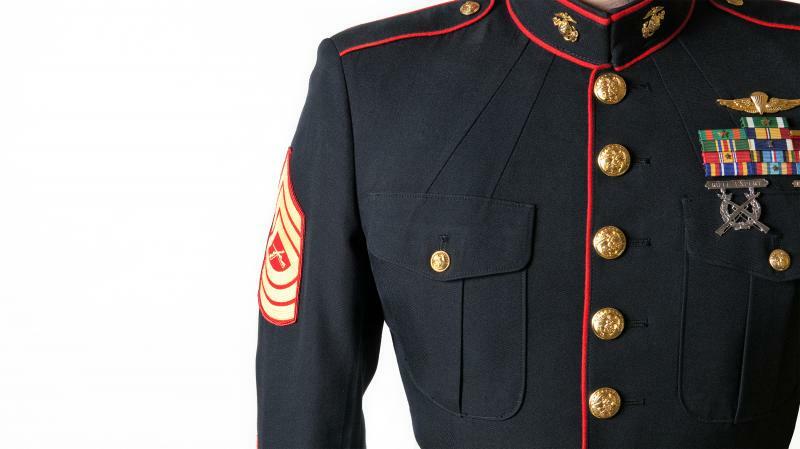 The number of buttons required for a soldier's coat could be as many as twenty to thirty. Each country, region, and specialization within the armed services required their own individual designs. Uniform buttons carried over into civilian life, as modern businesses, such as airlines, and local law enforcement agencies required special buttons for their uniforms. Beginning in the early nineteenth century men's dress became much plainer and less ostentatious. Portraits by Jean-Auguste-Dominique Ingres (1780-1867) show men's fashion in the first half of the nineteenth century with plain gold metal or fabric buttons of the same color as the garment on which they are sewn. Women's bodices and outerwear became the outlet for the display of decorative buttons by the mid-nineteenth century. Women's buttons followed trends in jewelry: colored enamel, porcelain, pearl, silver, and jewels were used. Jet and black glass, introduced during Queen Victoria's mourning for Prince Albert, remained popular to the end of the century. The nineteenth-century button industry continued along the two lines that had been established in the eighteenth century; industrial progress continued concurrently with handcraft techniques, which generally followed the historical revival styles of nineteenth-century decorative arts. In 1812, Aaron Benedict established a metal button-making factory in Waterbury, Connecticut, to supply metal buttons for the military. Until that time many metal buttons were still coming from England, but the War of 1812 brought trade between the United States and Britain to a halt. As of 2003, Benedict's company, which became known as Waterbury Buttons, had been in business for 191 years. It is the oldest and largest producer of stamped metal buttons in the United States. Statistics from 1996 show that they produced 100 million buttons-about one-half for fashion trade and the remainder for military and commercial clients. Metal remains the main type of mass-produced button because the material lends itself to mass-production techniques. The French firm Albert Parent et Cie, founded in 1825, exemplifies the brilliance of French manufacturers who combined mass-production techniques with the hand-finished details to produce luxury buttons in the manner of the eighteenth century. The company left an archive of sample books showing over 80,000 examples of buttons in every available technique of the time. While more buttons were mass-produced in the nineteenth century that did not mean that fewer materials were employed in the creation of buttons. Natural materials like horn and shells, which had been used for centuries, were rediscovered as mass-produced items. New materials such as celluloid, the first plastic, were used as early as the 1870s to imitate other materials. Representational picture buttons, first introduced in the late eighteenth century, reached their peak between 1870 and 1914. The nineteenth-century scenes were generally mass-produced stamped metal designs depicting any motif imaginable, but contemporary marvels like the Eiffel Tower were especially popular. The late nineteenth and early twentieth centuries saw more and more men and women wearing suits with linen or cotton shirts underneath, the new uniform for the emerging white-collar working class. Both suit jackets and shirts required buttons as fastenings and they created the need for large numbers of inexpensive buttons. Thus, the four-holed pierced button was introduced to both men's and women's fashions. However, fine jewelry quality buttons were still produced by some of the best-known retailers of the day such as Cartier, Liberty's of London, and Georg Jensen. Buttons received competition in the form of the new zipper that was patented in 1903 but did not come into general use until the 1930s. The zipper was considered a novelty at first and played a prominent role as decoration in the designs of top designers. Bakelite was invented in 1907 and by the 1930s had replaced almost all other synthetics for accessories. Durable and versatile, Bakelite was the medium for some of the most extravagant buttons of the twentieth century, but other plastics eventually replaced it. Three-dimensional accessories, such as fruit shapes, were created in the 1930s and 1940s when small accessories like buttons were especially popular. The designer Elsa Schiaparelli (1890-1973), who was allied with surrealist artists in the 1930s, is notable for her use of extraordinary custom-made buttons. Plastics replaced most inexpensive glass and pearl buttons by the 1960s. That coupled with the fact that natural materials such as ivory and tortoiseshell are now banned in the United States and other countries has led to the dominance of plastic buttons made to imitate these materials. Mother-of-pearl is still used but in much smaller quantities than in the past. American-made pearl buttons can cost from twenty-five cents to three dollars apiece, as some of the work must still be done by hand and the best shells are imported from the Pacific Ocean coastlines. The use of stretch fabrics and increasingly informal dressing have led to a decrease in the demand for button fasteners. They have become a symbol of nostalgia and anachronistic tradition, as evidenced by retro button-fly jeans introduced by denim manufacturers in the 1990s and the continued use of rows of tiny buttons on the back of bridal gowns. Buttons have become extremely collectible. The National Button Society exists for collectors and publishes a quarterly bulletin and holds an annual meeting and show. There are similar societies in Britain and Australia and elsewhere in the world. Military buttons represent a specialty among collectors, as the challenge of identifying the insignias of segments of the armed services adds to the interest of these items. Boucher, Francois. 20,000. Years of Fashion: The History of Costume and Personal Adornment. New York: Harry N. Abrams, 1987. DeMasters, Karen. "New Jersey & Co. Out of the Dust Emerge Lustrous Buttons." New York Times, 4 April 1999. Houart, Victor. Buttons: A Collector's Guide. London: Souvenir Press Ltd., 1977. Pearsall, Susan. "In Waterbury, Buttons Are Serious Business." New York Times, 3 August 1997. Roche, Daniel. The Culture of Clothing: Dress and Fashion in the Ancient Régime. New York: Cambridge University Press, 1996.